At 5’8”, 160 lbs., this blond, blue-eyed Atlanta, Georgia native has become a recognized face and name in movies and television, as well as his behind the scenes work. 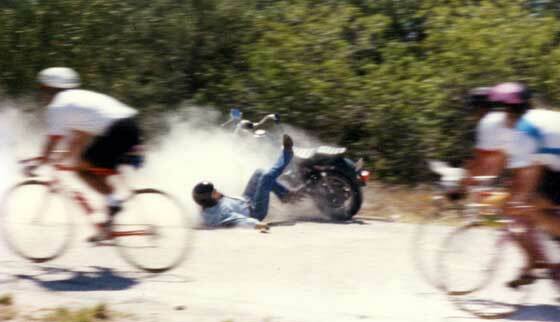 Daredevil Ellis always had a taste for danger, and began his career at a young age jumping bicycles and mini bikes over ditches, racing go-carts and falling off horses. He received his first motorcycle at the age of six, which he would ride everyday perfecting a skill that he would use repeatedly throughout his career. During high school Ellis got his first taste of racing motorcycles and fabricating four-wheel drive trucks and racecars. Late night working in a local garage, fixing cars and driving a wrecker was a way of life during his senior year in high school. 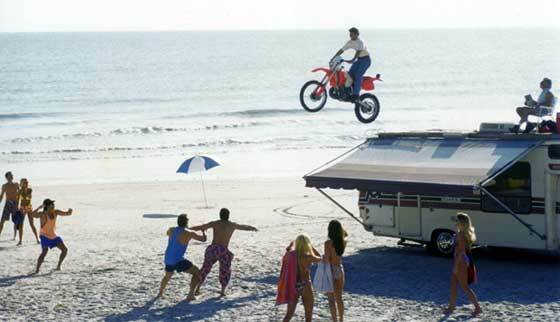 His life long dream of being a stuntman was soon to be realized. In the early ’80′s, Ellis was given his first chance to work on a movie set, “Heavenly Kid”. During this time, a good friend, Ed Spivia, former Georgia Film Commissioner, gave Ellis some ramps that were left behind from the film production of the movie “Tank”. 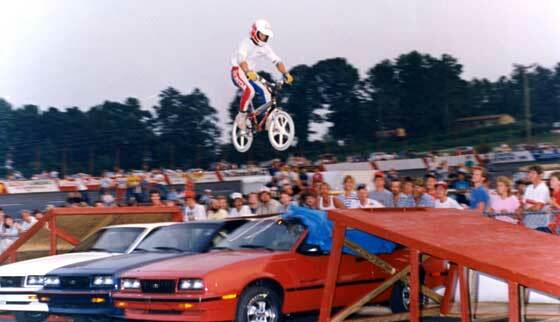 Ellis began perfecting his art even further as he began jumping his dirt bike over cars from ramp to ramp. With help from family and friends, he was on his way to promoting his own live shows. 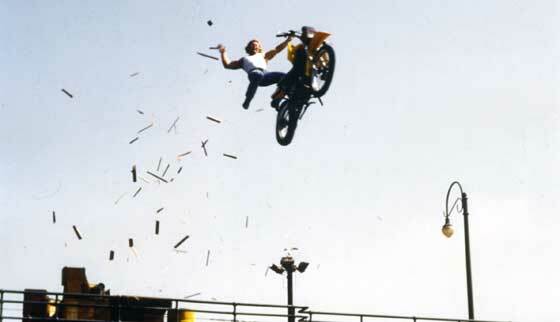 In 1986 he formed the company Stuntworks USA, Inc.. 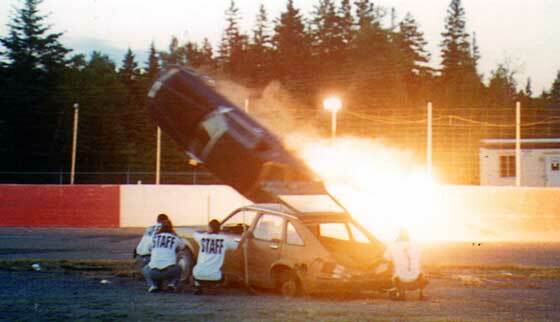 He performed at arenas, racetracks, monster truck shows, fairs and other local events jumping and coordinating his stunts, ultimately breaking world records. His first indoor show was at the ONMI Arena in Atlanta for a sell out crowd. He continued his performances at hundreds of venues with such acts as The Steel Wall – Crash of Death, pipe ramp rolls, truck, bicycle and skate jumps for thrilled and cheering crowds of 20,000 plus attendance. This gave Hollywood Stuntman, Ellis Edwards, the opportunity to be featured in TV commercials, on radio shows, and in magazines and periodicals. Untiring, Ellis continued to work on motion pictures and episodic television with such stars as Don Johnson, Danny Glover, Brad Pitt, Pamela Anderson, Robert Ulrich, and David Hasselhoff. 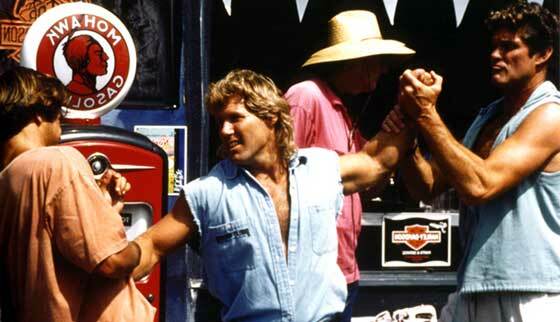 Ellis worked with long time friend, Terry “Hulk” Hogan, on the television series “Thunder in Paradise”. He then went immediately to do stunt work and bit parts on “Baywatch” where Ellis was also featured in guest star roles playing himself, a dare devil stuntman, named Johnny Danger. In 1995, Ellis was grabbed up by Turner Television as the Stunt Coordinator for “World Championship Wrestling” for a 5-year engagement. Since 2002, Ellis has been the Stunt Coordinator for Vince McMahon’s “World Wrestling Entertainment” with many renowned accomplishments to his credit. 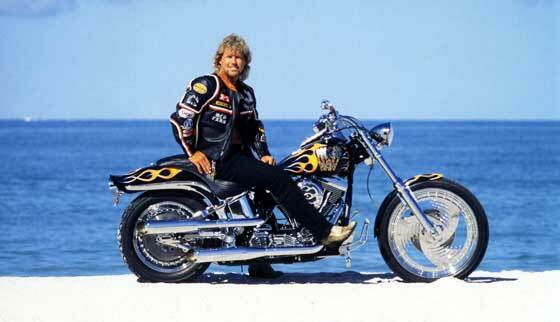 Ellis’ other love is fabricating, riding, and showing vehicles of all types… the more original the better. He has been a Guest Builder on “Monster Garage” creating the U-Haul/Wrestling ring vehicle. He can be found throughout the year supporting Abate and various charities and charity rides. Many thanks to Ellis’ family, friends and promoters who have supported him to become an accomplished stuntman, coordinator and actor in the television and film industry.